Inasmuch as Bible instruction was an important function of both the synagogue and the church, it is no surprise to discover that the public reading of the Scriptures was among the regular activities of both. The value, even necessity, of the reading of Scriptures orally in both the synagogue and the church is further recognized when it is pointed out that considerable numbers of individuals in the first century were completely illiterate and could not read the sacred text for themselves at all. Besides this, the high cost of manuscript copies of the Bible made private possession and private reading of the Scriptures well beyond the reach of most individuals. This account is rich in details. First, we see that the scrolls were under the care of one called the attendant or servant (Greek huperetes). This agrees well with what we find outside the NT regarding the sacred Biblical synagogue scrolls (see below). Second, it is evident that one apparently did not need to be an official in the synagogue in order to be the designated reader for the day; one need only be Hebrew-literate. With this the Mishnah agrees (again, see below). Jesus stood as He read from the Scriptures, a point in agreement with the practice as described (or prescribed) in the Mishnah (see below). Only after returning the scroll to the attendant did He sit down to teach. 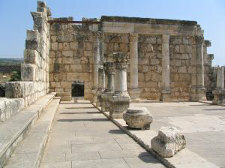 A second reference to the public reading of the OT in the synagogue is in Acts 13, when Paul was in Antioch in Pisidia. Acts 15 describes the first international council of Christians. In the process of giving the judgment of the Jerusalem elders regarding the relationship of Gentile believers to the Old Testament law, James in passing alludes to the Jewish practice of Torah-reading: “For Moses has from ancient generations in every city those who proclaim him, being read every Sabbath in the synagogues” (Acts 15:21). From the details James gives, had we only his account, we would still understand that it is a Jewish religious practice he describes, since Moses (the Jewish prophet) the synagogues (the place of Jewish worship) and the Sabbaths (the day of Jewish worship) are noted. This reading is further described as a weekly practice. Here the allusion is made to the synagogue practice of publicly reading the Scriptures, an allusion many if not most of Paul’s readers in Corinth would have understood since they were converts to Christianity from Judaism. The reading of “Moses” (that is, the Pentateuch) is specified, though the seemingly broader designation “old covenant” is also used. In the post-New Testament era, the reading of “the Law and the Prophets” was standardized or at least codified. The Mishnah (edited and published ca. AD 200 by Judah ha-Nasi) gives detailed instructions for the public reading of the Scriptures. Tractate “Sotah” describes the ritual by which the scrolls were handled when the high priest, and when the kings were obligated to read them. It may be safely assumed that with a few changes of details, the same would apply to the ordinary reading of the Law and the Prophets in the synagogue. Obvious similarities with Luke’s account of Jesus’ reading from the scroll of Isaiah are evident: the scroll in the custody of the “minister,” who passes it to the reader (in the special occasions described in Sotah, through several intermediaries), who takes the scroll and reads it standing. These give a more detailed and regulated form to the reading of the Law and the Prophets than is evidenced by the New Testament, such as would be expected in the process of a century and a half’s developments between the NT and the Mishnah. This would, by implication, support the traditional mid-first century dating of events and accounts in the NT. 2 The famous Pericope de adultera, John 7:53-8:11, recognized by most specialists in NT textual criticism as not an original part of John’s Gospel (see, for example, Bruce M. Metzger, A Textual Commentary on the Greek New Testament, pp. 219-222) does mention twice that Jesus “wrote on the ground” (kategraphen eis ten gen, v. 6; egraphen eis ten gen, v. 8. In both verses, some manuscripts specify that He wrote “the sins of each of them”). Yet A. T. Robertson points out that, “the use of katagrapeo leaves it uncertain whether he was writing words or drawing pictures or making signs” (Word Pictures in the New Testament, vol. V, p. 139). It is possible that Jesus is described as idly doodling in the dirt as the force of His words sank in. 3 raka, Matthew 5:22; mamona, Matthew 6:24; talita kumi, Mark 5:41; abba, Mark 14:36; eloi eloi lema sabachthani, Mark 15:34; etc. For a detailed discussion of Aramaic elements in the NT and the influence of Aramaic on the Greek of the New Testament, see A. T. Robertson, A Grammar of the Greek New Testament in the Light of Historic Research, pp. 102-108; and my two articles “All the Aramaic Words in the New Testament,” As I See It, 6:5; and “Well, Almost All the Aramaic Words in the New Testament,” As I See It, 6:6. 4 Robertson says that Jesus often spoke in Greek (Grammar, preface, p. xix; The Minister and His Greek New Testament, p. 17). When He stood before Pilate, for example, no translator is mentioned, though this is of course an argument from silence. For a discussion of the languages of Jesus, see Robertson, Grammar, pp. 25-29. 5 The text as recorded in Luke’s Gospel follows pretty closely the LXX version of the text, though lacking one clause in Isaiah 61:1, LXX, and adding a clause found in Isaiah 58:6, LXX (see Gleason Archer and G. C. Chirichigno, Old Testament Quotations in the New Testament, pp. 128-129; Thomas Hartwell Horne, An Introduction to the Critical Study and Knowledge of the Holy Scriptures, vol. 2, part 1, p. 291, n. 2). 6 [Letteris, Meir Ha-Levi], ed., Torah, Nevi’im uKhetuvim, pp. 1386, 1389. 7 See C. G. Montefiore and H. Loewe, A Rabbinic Anthology, p. 544. 8 Reportedly, the Talmud declares that the practice of haftorah readings on the Sabbath goes back to the first century A. D., with the early Tannaim gradually arranging for the reading of a specific haftorah for each portion of the Torah. See Naomi Ben-Asher and Hayim Leaf, eds., The Junior Jewish Encyclopedia, “Haftorah,” p. 120. 10 For a superb analysis of this and other designations of the OT canon, see Roger Beckwith, The Old Testament Canon of the New Testament Church, especially pp. 105-109, 142-143. 11 2 Corinthians 3:14, 15. 12 H. Danby, The Mishnah, Sotah 6:7, 8; p. 301. See also Yoma 7:1; p. 170. 13 Literally, “scroll,” that is the scroll of Esther, which was not part of the regular cycle of readings from the Law and the Prophets. 14 H. Danby, The Mishnah, “Megillah” 2:1; 4:1, 3, 4, 5; pp. 203, 205, 206.